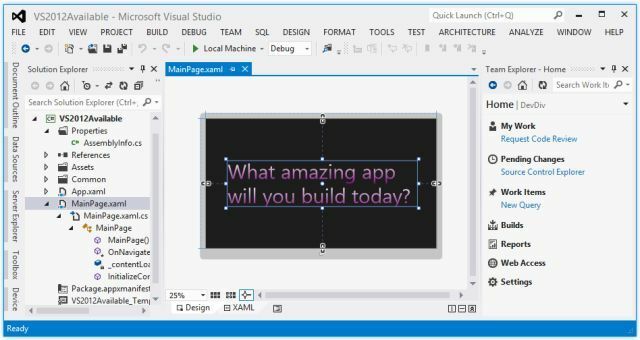 Microsoft has finally released the Final RTM version of Visual Studio 2012 for general public and for developers worldwide. Microsoft Visual Studio 2012 is now officially available for download via MSDN Subscriptions, TechNet Subscriptions and also available via Microsoft Download Center. Microsoft has released Visual Studio 2012 in four versions named Visual Studio 2012 Ultimate, Visual Studio 2012 Professional, Visual Studio 2012 Premium and Visual Studio 2012 Test Professional (for beginners). Microsoft has also confirmed that company is going to release the Final RTM version of Windows 8 on October 26th, 2012 for retailers and general public worldwide. With the released of Visual Studio, Microsoft has also released and launched .NET Framework 4.5 via MSDN subscriptions, TechNet subscriptions and on Microsoft Download Center for general public and developers. Microsoft users can Download Microsoft Visual Studio 2012 Ultimate, Professional and Premium Versions Final DVD ISO Image File from MSDN, TechNet and MS Download Center OR you can also download it from Direct Download Links from Microsoft Servers available below with the supported architectures of 32-bit (x86) and 64-bit (x64). The official Microsoft Visual Studio 2012 Virtual Launch Event is yet to be held on September 12, 2012. If you want to attend the Online Launch Event of Visual Studio 2012 than you can join it here. Microsoft has yet to reveal more details other than the date on event launch. Microsoft Visual Studio 2012 Ultimate, Professional and Premium versions are available with 90 Days trial period for Free Users. If you want to use it for lifetime than users have to get Genuine Activation Key of Microsoft Visual Studio 2012 by purchasing the product from Microsoft Store. If you want to compare the features of all these three version of Visual Studio than you can head over the Microsoft Visual Studio 2012 Ultimate, Professional and Premium Comparison Chart below for more details and information. We have also shared the minimal and estimated Retail Price of Microsoft Visual Studio 2012 Ultimate, Professional and Premium Versions in a chart below with Direct Download Links of Microsoft Visual Studio 2012 Ultimate, Professional and Premium Versions Final DVD ISO Image File with the supported architectures of 32-bit (x86) and 64-bit (x64). We have also shared the detail information covering all the possible System Requirements and Hardware Configurations required for the installation of Microsoft Visual Studio 2012. If any user wants Microsoft Visual Studio 2012 other than English version than you can also Download Visual Studio 2012 Language Pack from the link available below. Users can easily differentiate and compare the features offering from Microsoft Visual Studio 2012 Ultimate, Professional, Premium and Test Professional versions from the chart below. Users can easily pickup their required versions of Visual Studio 2012 with the price tag and retail cost from the chart below. Users can find the relevant system requirements and hardware config details of all three versions of Visual Studio 2012 including Visual Studio 2012 Ultimate, Professional, Premium and Test Professional from below. Users can Download Microsoft Visual Studio 2012 Ultimate, Professional and Premium Versions Final DVD ISO Image File from the Direct Download Links available below with supported architectures of 32-bit (x86) and 64-bit (x64) directly from official Microsoft Servers. For Genuine Activation Keys of Visual Studio 2012 users have to purchase the product from Microsoft Store. If any user wants Microsoft Visual Studio 2012 other than English version than you can also Download Visual Studio 2012 Language Pack from the link available below.